Rent our new mechanical surfboard simulator. We rent the Robo Surf to all of Northern California and California. A perfect add on to give your luau, Hawaiian theme or tropic party that special touch of excitement. This is more challenging than what you think. We can control the speed and the difficulty, you just need to hang ten and see how long you can ride that wave. Our mechanical surfboard or robo surf rental is a great opportunity for creating memorable pictures with your family and friends, sharing on your Facebook page and Tweeting. 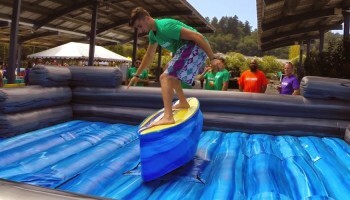 We have added a premium inflatable to go with our mechanical surfboard (see pictures). This is a really fun and safe interactive to add to your event or party. Whether you are having your party in the San Francisco Bay Area, Santa Cruz, Monterey Bay, Central Coast, San Jose Silicon Valley, or the East Bay, we have your mechanical surfboard ready to rent for your next event or party. 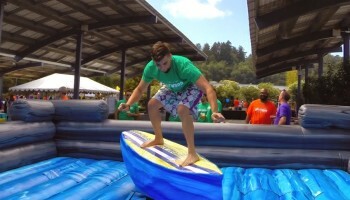 Our mechanical surfboard rental can be set up inside or outside. If set up inside, make sure you have plenty of overhead clearance. We require an area of 25ft x 25ft (with our premium inflatable) or 20ft x 20ft (our round water looking inflatable) in surface area and 12ft of overhead clearance.